Ideal cameras that I’m talking about are images that have been noproj’d together, such as LRO-NAC and HiRISE observations. Previously I thought this was impossible because Qnet required unique serial numbers for all observations and getsn on a noproj’d image just returned an ‘unknown’. Turns out ISIS can totally do this. You just need to make a couple modifications. 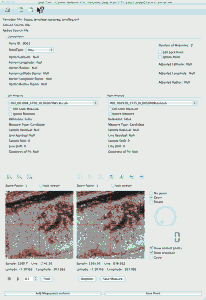 Download the Ideal data set. After you’ve done this, you are now able to run getsn and qnet successfully on the noproj’d imagery! This greatly simplifies the workflow I described for HiRISE in this post. I’ve previously written a tutorial on performing a bundle adjustment, jigsaw in ISIS lingo, using CTX. Let’s try something a little bit more complex with LRO-NAC. If you are not previously aware, LRO-NAC is actually two separate optical assemblies that are joined by the spacecraft bus. Ideally this spacecraft hardware would be solid as a rock and wouldn’t bend. Unfortunately that’s not the case, so what would have been a bundle adjustment between 2 cameras is now 4 in the case of LRO-NAC. Picking a stereo pair has always been the most difficult part of the job for me. I honestly don’t know how to find stereo pairs. So instead I’m just going to recreate something ASU did in SOCET SET. If you are not aware, ASU has processed about 100 DEMs with LRO-NAC. I’m going to recreate their Moore F Crater DEM using M125713813 and M125720601. You can download the raw data via PDS. I picked this stereo pair blindly and it ended up being extremely difficult to register correctly. In order to help out, I added a fifth image to the bundle adjustment to give another orbit’s worth of spacecraft ephemeris into the measurements. That image was M110383422LE and I picked it because it overlapped 2 of my previous images and had the same lighting conditions as my previous images. * The ‘parallel’ command is GNU Parallel, a non-standard system utility that I love dearly. From a previous article I wrote about, we saw that map projecting against the WAC Global DTM gave much better results than working against the sparse LOLA that is the default for map projecting by in ISIS. So I’m going to do that now. Once we have a successful jigsaw result, then we’ll map-project. If you forgot how to attach the WAC Global DTM, here are the commands I used. My image pair was at 37.3N and 185E. So the tile WAC_GLD100_E300N2250_100M.IMG from this link was what I needed. Making the control network is pretty straightforward and is just time consuming. I performed the commands I previously outlined here on this blog. I had to spend a lot of time in Qnet for this stereo pair. About half of my automatic matches didn’t work. (Possibly my search range was too small?) In order to correct this, I had to then manually edit the output control network in Qnet. I then filter down all the control points to the ones marked ‘Ignored’. Then I just manually align the measurements. You just need to get the measures close to the right spot by clicking on the same feature. Afterwards, you can then click the ‘Register’ button to get subpixel accurate alignment. Autoseed and AutoReg also have a bad habit of only matching LE images to LE, and RE images to RE. 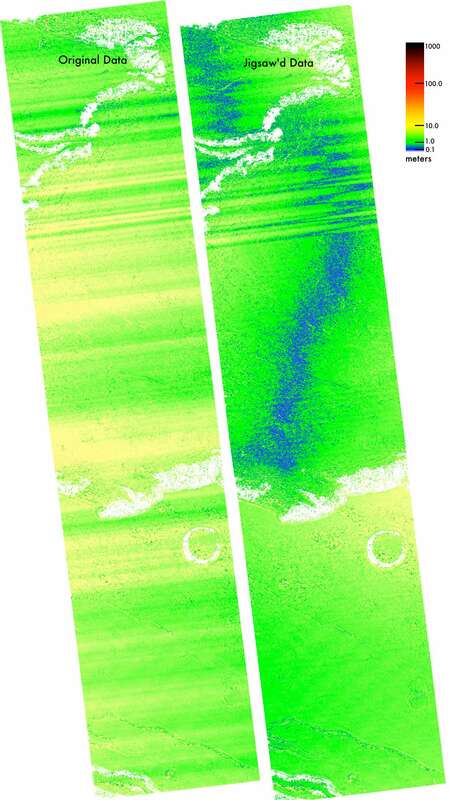 It is a good idea to run along the edge of an LE image and try to find common points that are seen in both RE images. These are going to be the few control points that have more than 2 control measures. I also had to do this between my 5th image and the other 2 images that it had overlap with. This problem was likely because the overlap between these 3 images didn’t meet the requirement of MinimumThickness in Autoseed.def. Normally at this point I would then recommend to you to start picking out ground control points. I tried that. Then I went a little insane. I’m better now. Instead we’re going to do crazy stuff in the next section. The reason we’re not using GCPs, is that the only source to align against is the WAC Image mosaic. I tried this and I could easily get a bundle adjustment result that aligned well with the image mosaic. However the output DEM would always show a massive error between my height results and the results of LOLA and the WAC Global DTM. After adding the 5th image and clamping the trust of my GCP to 50 meters in radius, I got a result that matched LOLA and WAC DTM in an okay manner but didn’t really align at all to the WAC image mosaic. Things made sense once I compared the image mosaic to a hillshade of WAC DTM. 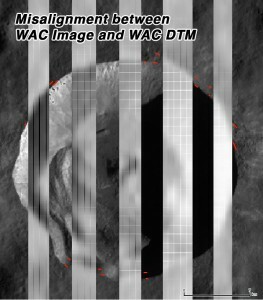 WAC’s Image mosaic doesn’t agree with WAC’s Global DTM! Ghaaaa! Madness! I was so incredibly disappointed. I didn’t know what to do at this point, so I just dropped the ground control points. Alrighty then, time to start bundle adjusting with jigsaw. Likely on the first run things are going to blow up because bad measurements still exist in the control network. My solution to this was to first have jigsaw solve for only a few camera parameters and then check out the output control network for features that had the highest error. In Qnet you can filter control measures that have errors higher than a certain amount of pixels. After I fixed those measurements manually, I resave the control network as my input network and then redo the jigsaw. After iterating many times, I eventually produced a control network and jigsaw result that had a sigma0 of .34 pixels. However, if we’re to write this camera solution to file and then make a DEM, we would see that I have worse alignment with LOLA than if we hadn’t bundle adjusted at all. So how can we get a good bundle adjustment result that aligns well with LOLA? One idea would be to pick GCPs directly against LOLA using their gridded data product. I know folks in the USGS who have done exactly this. However I don’t even see how they can determine correct alignment, so I’m going to ‘nix that idea. Another idea would be to have Jigsaw not solve for radius (radius=no), but instead use only the radius values provided by LOLA. This will keep problem in the ball park, but the resulting jigsaw solution will have a sigma0 around 15 pixels! Not solving for radius essentially ties our hands behind our back in the case of LRO-NAC when our radius source is so incredibly low res. What we need instead is to simply constrain / rubber-band our Control Points to have radius values that are similar to LOLA. Unfortunately, how do we determine what correct Lat Long to sample the LOLA radius for each control measure? My solution was to not define that. I did two things: (1) I changed all my control measures from ‘free’ to ‘constrained’ with a sigma of 200,200,50. This can be performed with cneteditor. (2) I then wrote and ran the following bash script. Your mind should be blown at this point. I’ve essentially written an iterative closest point algorithm using the ISIS utilities jigsaw and cnetnewradii. This process is only able to work because we have a perfect control network that we vetted with the previous jigsaw runs. This also works because our LOLA data here is not flat, and has plenty of texture. Finally, LRO-NAC was close to the correct solution. Imagine images with horrible attitude data, like Apollo, would just blow up with this technique. On each iteration, the sigma0 shouldn’t change. Or if it changes, it should be extremely small. That’s because a translation or scale change of the control points and camera location has no effect on the reprojection error. What should be reducing on each iteration is the standard deviation of the radius correction for each control point as listed in bundleout.txt. The sparse 3D model of the problem in Jigsaw is slowly fitting itself to the LOLA DEM but constrained only by the camera geometry. The standard deviation of the radius correction will never go to zero and will eventually plateau. This is because there will always be some error against LOLA since large portions of the measurements are interpolations between orbits. 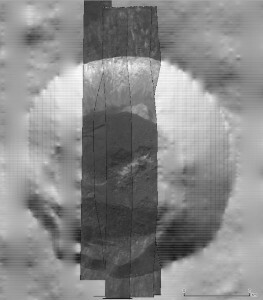 Disclaimer: I’ve only tried this technique for this LRO-NAC stereo pair. I don’t know if it will work for others. However this was the only technique I could come up with that would produce results that best aligned with LOLA. I couldn’t get anything good to come out of using WAC Image Mosaic GCPs. Now that we have an updated ephemeris, we’re ready to perform a map projection to speed up stereo. Be sure to not accidentally spiceinit your files, which would wipe your updated ephemeris. Notice that I’m map projecting everything at a low resolution. This is because I’m in a hurry for this demo. In a production environment for LRO-NAC, we would likely map project at 1 MPP or 0.5 MPP. This step and ASP’s triangulation are usually the longest part of this entire process. Nothing special here, I’m just processing the LE-LE, RE-RE, and LE-RE combination. RE-LE stereo pair wouldn’t resolve anything at 5 m/px. Afterwards, I gdalbuildvrt the outputs together. The massive lines separating the individual DEMs that make up this stereo pair may concern you. However that effect will diminish if I had map projected my inputs at a higher resolution. The reason being that, correlation is much like convolution, in that we erode the input image by a half kernel size along the image border. That border gets perceivably smaller if the image is of higher resolution. Now the moment you’ve been waiting for. The point where I have to prove I’m not crazy. I have three versions of this stereo pair. There is the result produced by ASU using SOCET SET and then there’s ASP with and without Bundle Adjustment. The look of ASP’s result will be a little shoddy because I map projected my input at 5 m/px which prevent me from get the most detail out. It did however save me a lot processing time while I experimented this method out. 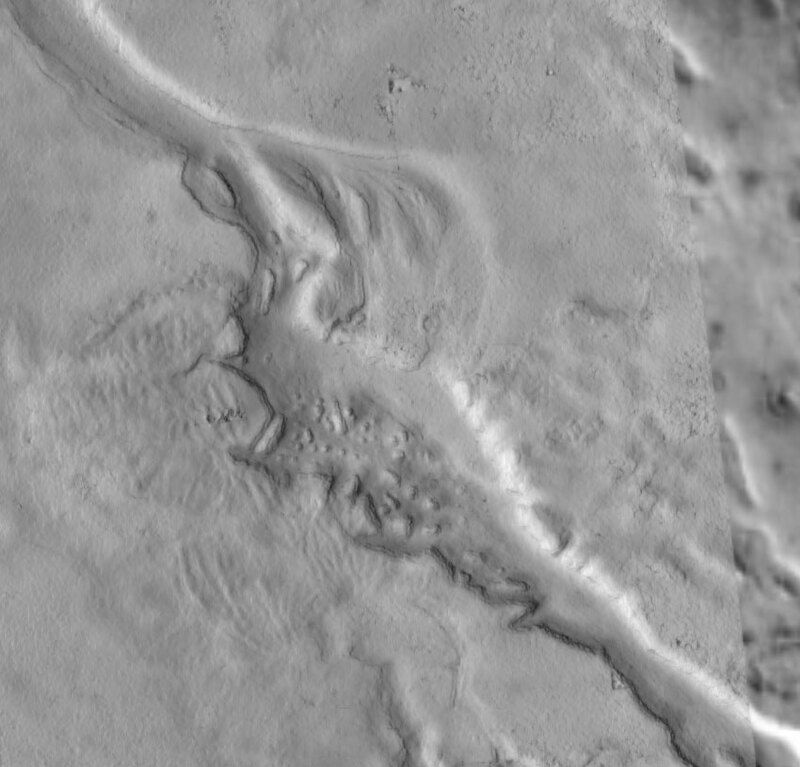 Here are the hillshades for those 3 datasets overlaid a hillshade of the LRO-WAC Global DTM which is 100 m/px. There’s not much to tell, but you can at least see that everyone seems to have decent horizontal alignment. Here are the difference maps between those 3 datasets and the LRO-WAC Global DTM. Here are the difference maps between those 3 datasets and the LOLA Gridded Data Product, which I resampled to 100 m/px. I think this shows straight forward the improvement bundle adjustment made to the output DEM. Just for giggles, I also did a difference between the ASU DEM and the bundle adjusted ASP DEM. They’re pretty close to each other. There seems to just be a simple tilt between the two or that the ASP DEM is just shifted to a slightly lower latitude. Who’s more correct is anyone’s guess for now. Ideally at this point I would then compare the ASU DEM and the BA’d ASP DEM against the raw LOLA shot points. This is where curiosity got me and where I move on to the next personal project. Maybe someone else would be interested in a more rigorous review. Also, I’m not sure if the 5th image is required. Measurements of the Satellite’s position and pose are often not perfect. Those minor mistakes can cause gross offsets when producing DEMs from cameras with such long focal lengths. Correcting this is achieved with bundle adjustment. I’ve discussed this before, but I’d like to expand my previous article by adding ground control points. Ground Control points are special measurements in an image that have well known geodetic position. On earth, this might be achieved with a large target (an expedition’s tent) that can be observed with a satellite and has a GPS beacon. We don’t currently have such an analog on the Moon or Mars. The best bet is to instead compare an image against a good world map and then pick out individual features. For Mars, I think the best map to register against is the THEMIS global Day IR 100 m map. For the Moon, I would pick the 100 m LRO-WAC DTM and Image mosaic. 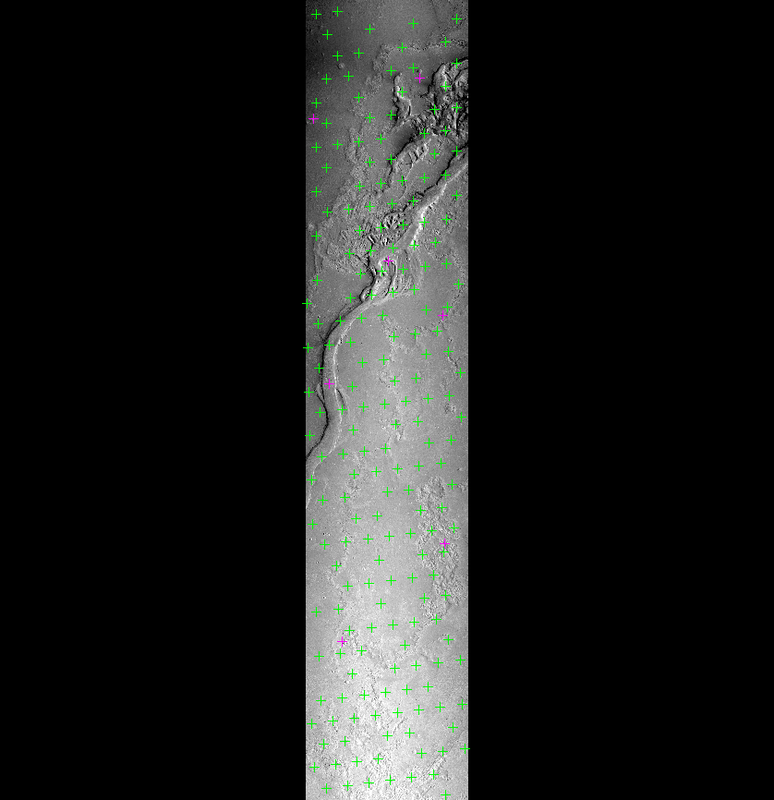 In the following sections, I’m going to run through an example for how to register a pair of stereo CTX observations to the THEMIS global map. For those who are interested, my example images are of Hrad Vallis and use P17_007738_2162_XN_36N218W and P18_008028_2149_XN_34N218W. Unfortunately the data you download is just a simple PGM file that mentions nothing about how it was georeferenced. That information can only be obtained through careful reading from the website. You however just need to know that the data is in Simple Cylindrical projection, it’s Geocentric, it’s sampled at 592.75 PPD, and that the files are indexed by their lower left corner. I’m going to leaving it up to you to read the documentation to see what the following commands in ISIS do. That documentation is available here from USGS’s website. 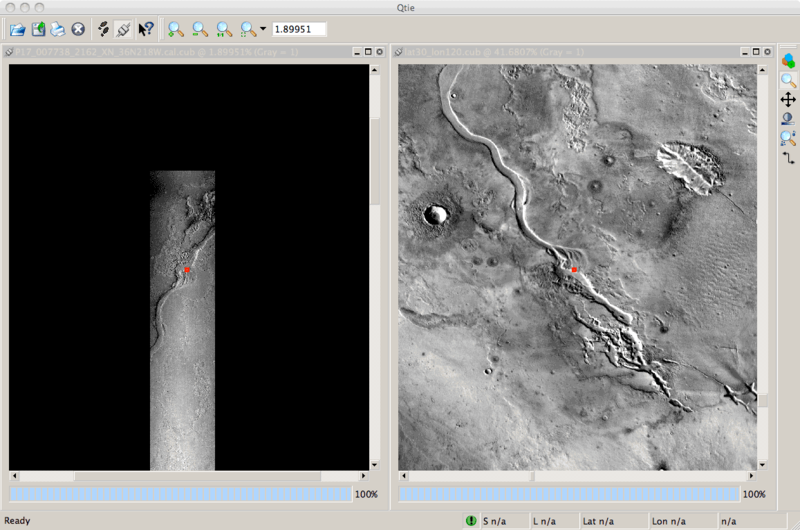 The tile I’m processing is “lat30_lon120.pgm” and I choose it specifically because it contains my example CTX images. I had to use an intermediate GDAL command because std2isis couldn’t read a pgm file. I’ve discussed this process before, and I’m not going to re-describe it. (I’m quite lazy). However, the following is a quick recap of the commands I used to do it. Then you’ll need to do clean up in ISIS’s Qnet after you’ve completed the above commands. In my experience, pointreg will only correlate maybe 75% of your control measures correctly. To clean these up quickly, just go into qnet and select that you want to filter your control points to show only those that have been “ignored”. Then go and save. I had an excess of control points, and decided to just delete a lot of my ignore points. You can see a distribution of my control points in the following Qnet screenshot. Finally, we are breaking new ground here. 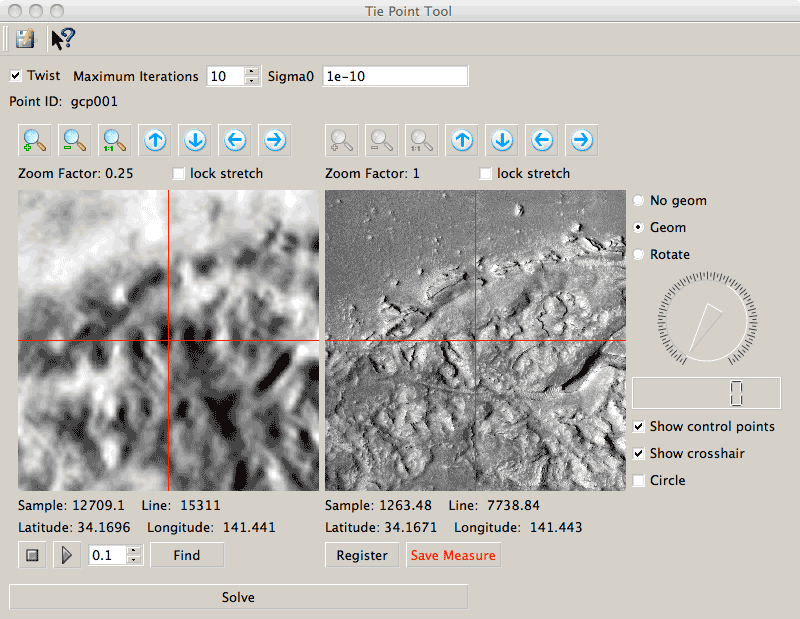 We are going to measure some ground control points against the THEMIS map tile we downloaded earlier. You could do this in Qnet, however in practice I find this segfaults a lot (I’m using ISIS 3.3.1). So instead we are going to do this process with Qtie. Open Qtie by simply just typing “qtie” into your terminal. Then click open button or command “O”. It will ask you for a basemap and you should select your THEMIS tile that is in cube format. It will then ask you for a “cube to tie to base”, select your first CTX image of the stereo pair. When it asks you for a control network, click cancel. If you actually give it your pointreg’d control network, it will go into an infinite loop because that control network has no GCPs. You’ll then want to use the ‘tie’ tool to create a bunch of GCP. 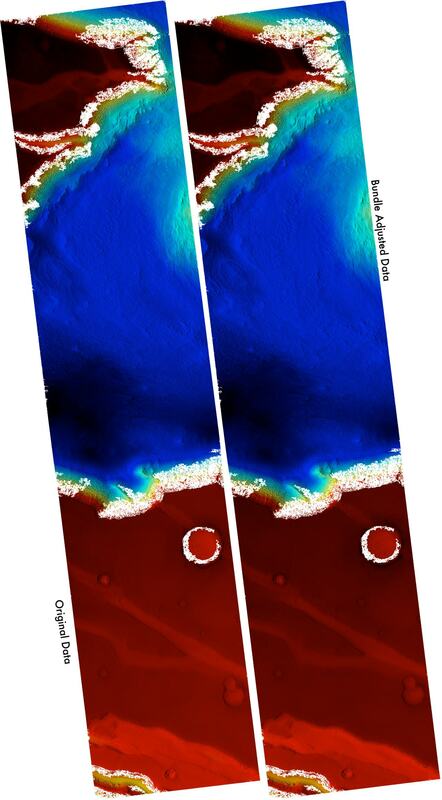 If you don’t remember, you have to right click on your CTX image to create a new measurement. You’ll want to capture at least 3 GCPs if you are working with a frame camera. Do about 10 evenly distributed GCPs if you have a linescan camera. 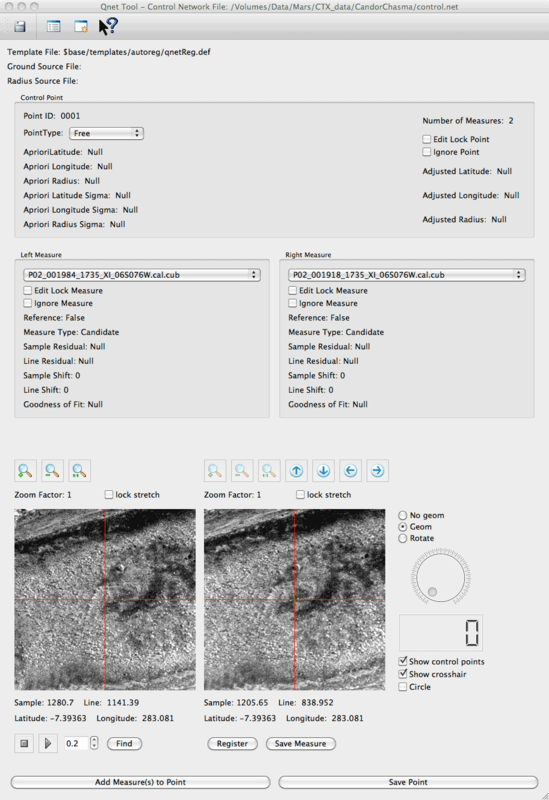 CTX is a linescan camera, so have fun clicking. 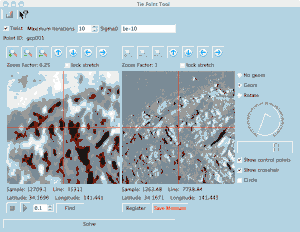 When matching a low-resolution image to a high-resolution image, I find it very helpful to turn on the affine alignment option in the “Tie Point Tool”. That is the “Geom” radio button on the right side of the window. I also find it very helpful to have the left window constantly flipping between the two input images at a high rate. You can achieve this by clicking the play button in the lower left and then lowering the number next to the play button. You’ll also want to zoom in on your basemap. On the left is an example of a match I found. This process is difficult and takes some patience. You’ll want to look at your match from different scales just to make sure that you haven’t aligned to some pareidolia. Once you finish, you oddly have to click the diskette in the “Tie Point Tool” to save your control network. I’ve saved mine as “gcp.net”. 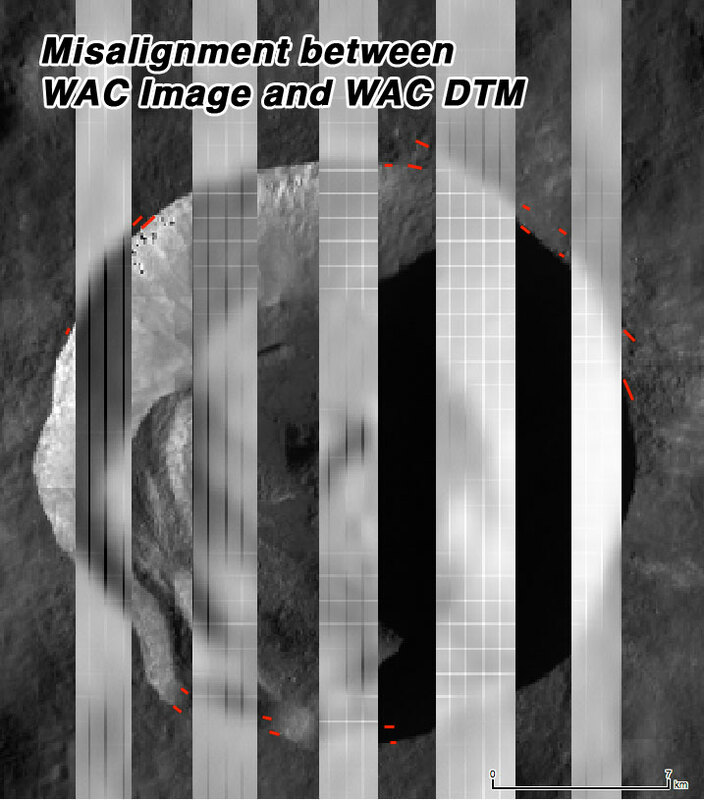 If you were selecting ground control points against the LRO-WAC Global Image mosaic (for registering images of the moon), you might want to take a detour here and use the “cnetnewradii” command. That way you can have your GCPs use radius measurements from the LRO-WAC Global DTM. Otherwise your radius measurements will come from ISIS’s default sources of an interpolated LOLA or MOLA for Mars. cnetmerge inputtype=cnets cnet=control_pointreg.net cnet2=gcp.net onet=control_gcp.net networkid=CTX_with_gcp description="against themis 100m"
Back in qnet, you’ll want to tie the other CTX image to your new GCPs. You can do this by open each GCP point up by double clicking it, and then selecting “Add Measure(s) to Point” in the Qnet Tool window. A screenshot is shown left. You’ll then need to manually align the control measures. 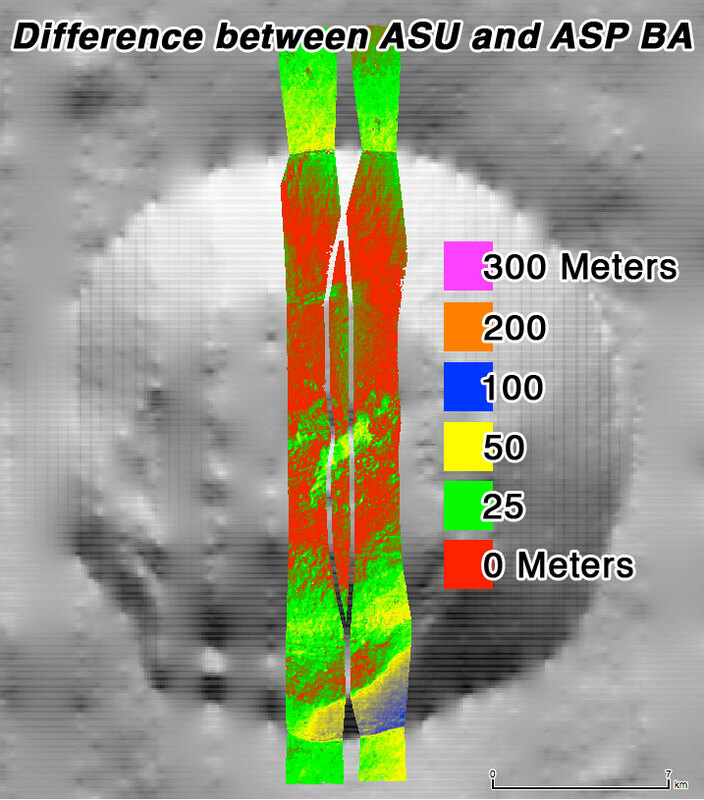 Be sure not to move your reference control measure from the first CTX image. You’ll also want to change your GCP’s PointType from “Fixed” to “Constrained”. This will allow your bundle adjustment session to move your GCP to reduce its reprojection error. However it will be rubber banded to the measurement you made in Qtie. This is helpful because your basemap source will usually have mistakes. After having registered all your GCPs to the other image, and also having set their type to “constrained”, you’ll want to do one last thing. Select all your ground control points in the Control Network Navigator and then press the “Set Apriori/Sigmas” button. I have a screenshot below. The sigmas are your uncertainty measurement for your GCP and basically tell bundle adjustment just how much it can ignore or trust your GCP measurements. Since our measurements were all made from the same source, we’re using the same sigma for all our GCPs. In my opinion a good sigma value is two times the pixel resolution of your basemap. So in this example, I’m putting the GCPs as being accurate to 200 meters in longitude, latitude, and radius directions. This time we can solve for the spacecraft’s position since we have GCPs! Do a test run without updating the spice. If it converges to a sigma0 less than 2 px, then you can go ahead an add the “update=yes” option. 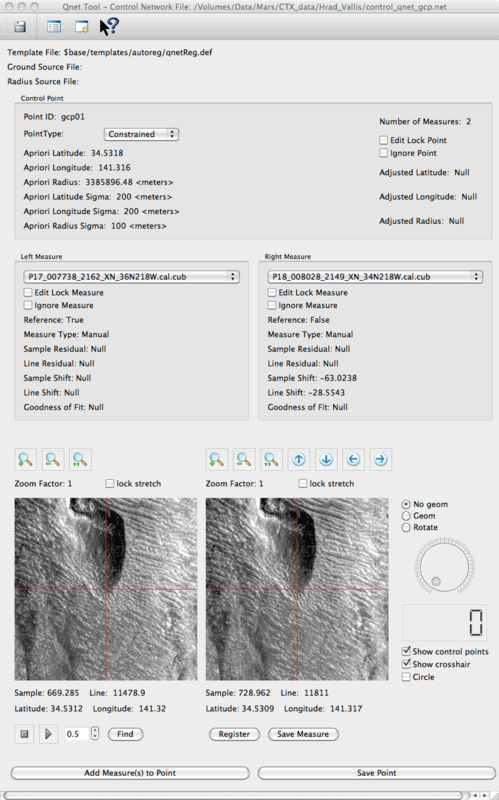 If you are working with LRO-NAC images, you can likely converge to less than 1 px sigma0. If you unfortunately didn’t converge or your sigma0 has a high value, you likely have a messed up measurement in your control network. This probably came from pointreg, where it managed to match to the incorrect repeated texture. You can identify the mistaken control point by looking at the output residuals.csv file that was created by jigsaw. Just go an manually align the control points in Qnet that show a high residual error. The error should be obvious in Qnet. If it is not, then likely jigsaw fitted to the outliers. If that happened, the control points with low residual errors will have the obvious misregistration in Qnet. Creating the above measurements and performing jigsaw took me about 2 hours. Creating the DEMs in Ames Stereo Pipeline took another 3 hours. Here are my results with and without my jigsaw solution rendered in Google Earth. 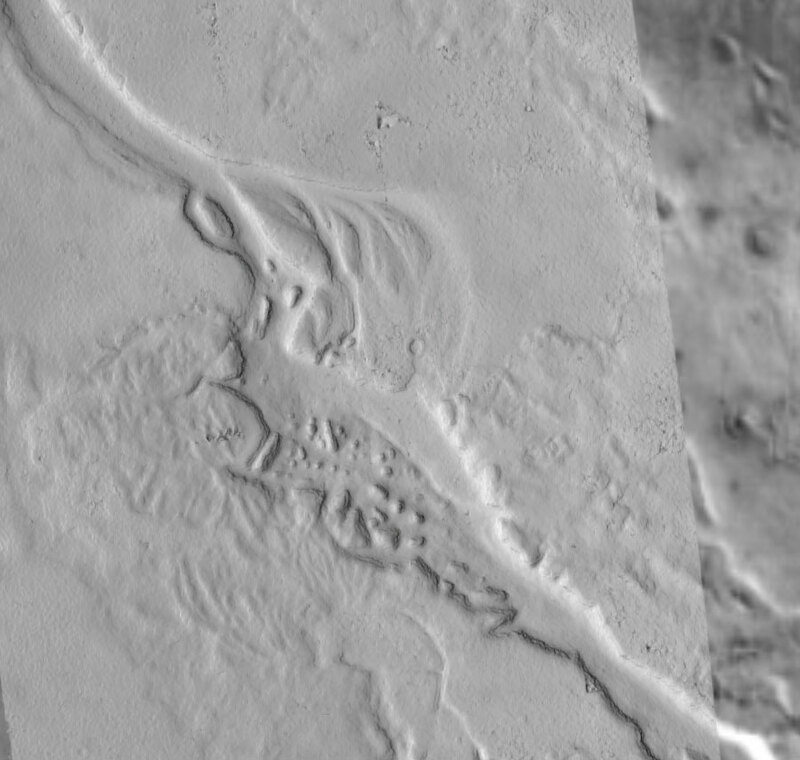 I’ve overlayed a hillshaded render of my DEMs at 50% opacity on top of the THEMIS Map I registered to. My DEMs also look a little crummy since I just used parabola subpixel for speed in processing. Bundle Adjustment is the process of back solving for a camera’s trajectory and pose. This process needs to be performed for most satellites images at some point or another because there is always an error in the camera location. Satellite position and velocity is usually found though radio communications via the Deep Space Network via methods such as measuring the antennae direction, time of flight, and doppler effects on the signal. 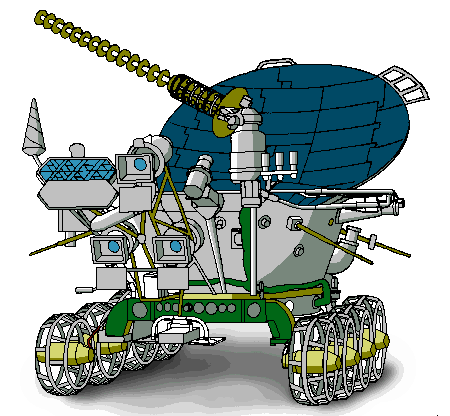 The spacecraft’s pose is usually made from outward facing cameras called star-trackers. All of this is surprisingly accurate considering that it’s a measurement made from at least one planet away but it doesn’t meet the demand of photogrammetrists who wish to register images to meter level precision. 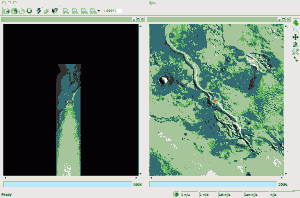 In this article, I’ll run an example of producing a control network and running jigsaw with USGS’s ISIS3 software. I’ll be playing today with two CTX images (P02_001918_1735_XI_06S076W and P02_001984_1735_XI_06S076W.IMG) that looked at the southwest end of Candor Chasma on Mars. Everything that is practiced here will equally apply to other missions with some additional number fiddling. You probably don’t need this reminder, but before you can do anything, these files need to be ingested into ISIS. I’m going to also take this time to radiometric calibrate and attach spice data. The parallel you see in my examples is GNU Parallel; its not usually installed on systems by default. I strongly recommend that everyone gets it and learns to use it as it is a time saving utility. Now that you have beautiful images of Mars, lets break into the new stuff. We are going to start by building a control network. Control Networks are databases of image measurements that are used during a bundle adjustment. It defines a location in 3D space called Control Points and the pixel locations for which that point projects into, called Control Measures. Before we go too far, we need to build some metadata so that the control network code knows how the images overlap. In the commands above, we have created 2 files, cube.lis and overlap.lis, that we’ll be repeatedly using. An interesting side note, footprintinit has created a vector layer inside each of the cube files that shows the lat-lon outline of the image. If one is so inclined, that vector layer can be extracted with an “isis2gml label=Footprint” call. 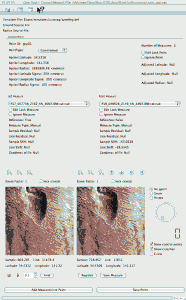 That gml can then be rendered with the gdal_rasterize tool or can be converted to KML with the ogr2ogr tool. Since most of the pretty NASA cameras are linescan, we are trying to bundle adjust a trajectory and thus need many control points. About 20-30 points are required. Ideally these control points would be distributed evenly across the surface of each image. ISIS has provided the autoseed command to help with that. The settings of how autoseed works is defined in the definitions file, autoseed.def. I haven’t given you this; so let’s take a look into what should be inside that file. The minimum thickness defines the minimum ratio between the sides of the region that can have points applied to it. A choice of 1 would define a square and anything less defines thinner and thinner rectangles. The minimum area argument defines the minimum square meters that must be in an overlap region. The last two are the spacing in meters between control points. I played with those two values so that I could get about 50 control points out of autoseed. Having more control points just makes for more work later on in this process. After the autoseed command, we finally have a control network that we can view with ISIS’s qnet utility. Run qnet in the terminal and a window should pop up. You’ll then have to click ‘open’ and select the cube.lis file and then the control.net file that we created earlier. In the control network navigator window, select the drop down menu so that you can select ‘cubes’. Highlight the names that show up on the left side and then press the ‘view cubes’ button. You can now see the location of the control points in the two images that we have been playing with. However the alignment between the control measures is imperfect at this point. We can see this visually by requesting that qnet show us a single control point. In the control network navigator window, select the drop down menu and select points. Then in the left side, double click point ‘0001’. A new window should have popped up called ‘Qnet Tool’. You should click on the ‘geom’ option in the bottom right of the window. The two pictures of this window show the control point projected into the reference image (left) and then the second image on right. You can click the right image or use the arrow keys to reposition the control measure. You can also click the play button on the bottom left of the window so that reference image keeps flipping between images. I prefer to operate with that window playing as it clearly shows the misalignment between measures. An example is show left if you click on the picture. Again all the settings are in the definition file. Here are the contents of autoRegTemplate.def. If you are a user of Ames Stereo Pipeline, these settings should look pretty similar. The search chip defines the search range for which pointreg will look for matching imagery. The pattern chip is simply the kernel size of the matching template. You will likely have to redefine the search range when you are working with new imagery. Use qnet to get an idea for what your pixel shifts are search ranges should be. A search range of 75 pixels in all directions is what happened to work for me with these specific CTX images. With those settings, I was able to register 38/47 existing control points! The reset I’ll have to register manually in qnet. Using qnet to quickly register points is a bit of a fine art that I don’t think I can describe here. Maybe when I have free time I could make a video. From my jigsaw’s terminal output, I can see that the starting projection error for this control network was 58.9 pixels on average. This is the sigma0 value under iteration 1. After jigsaw converged by rotating the cameras’ pose and by moving the control points, the sigma0 dropped to 1.2 pixels. This is quite an improvement that should help in DTM quality. If you happen to mess up and write a camera solution to your input files that is incorrect, you can simply run spiceinit to revert your changes. In the next version of Ames Stereo Pipeline (ver 1.0.6 or 2.0), we’ll probably be providing the ability to render the triangulation error of a DTM. Triangulation error is simply how close the projected rays of the image came together. It is one of many measurements that can be used to judge the quality of a DTM. 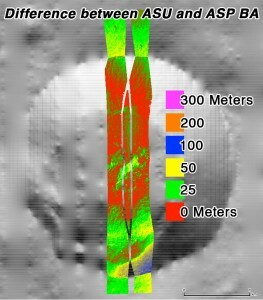 I’ve gone ahead and rendered DTMs that use both the jigsaw’d and non versions of these CTX images. On the upright right is their hillshaded colormap output. Visually, there’s not a noticeable difference between the two. However the height range has changed drastically. The orignal data produced height ranges between 0.6 km and 4.9 km however the bundle adjusted data produces a range between -8.9 km and -4.4 km. The colormap figure I’ve produced uses two different color scales for those DTMs just to simply show that the DTM hasn’t pivoted any. The only change was a height drop. I’ve also produce colormap output of the triangulation error. Here we can really see that jigsaw has made a difference for good. The color green represents a triangulation error of 1 meter, blue 0.1 meter, and yellow 10 meters. From the figure on the left, it’s clear to show that for the most part bundle adjustment improved every pixel in the image. I’m sorry that this has been a run on article. Writing this was also an experiment for me. I hope I’ve shown you how to use ISIS’s control network tools and I’ve managed to show myself that fixed ground control points in jigsaw seem to be required. I have very little trust in the absolute height values in the DTM. I think their relative measurements are correct but I was definitely not expecting the 10 km drop in height between non and bundle adjusted solutions.